The project Nonhuman Subjectivities at Art Laboratory Berlin (from January 2016 through November 2017) seeks to explore the theme of the ‘nonhuman’ within the work of emerging positions in the fields of Science-Art and Bioart. 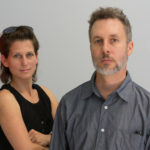 Of particular interest, in both practice and theory, has been the emphasis on nonhuman (animal, plant, microbial) agency and subjectivity, and even the cooperative involvement of the ‘nonhuman agent’ in the production of new artwork. As the[post] humanities finally respond to the ‘Copernican Revolution,’ more and more artists are taking up the role of vital actors in interdisciplinary fields between the humanities and natural sciences. In response to these current trends Art Laboratory Berlin initiated the series Nonhuman Subjectivities: during 2016 and 2017, presenting a complex series of exhibitions, events and symposia including artists and scientists as well as scholars from philosophy, animal studies, cultural studies and other disciplines. The artwork of British artist Anna Dumitriu is exemplary of a new type of hybrid practice between art and science. Dumitriu has been a long term member of the transdisciplinary consortium Modernising Medical Microbiology, a research group that deals primarily with bacterial infections (and especially antibiotic resistance). [iv] Embedded in the research group, she has been able to make use of laboratory facilities and scientific expertise, while becoming quite adept in microbiological practice in her own right. But one effect was that the purple stains quickly faded. 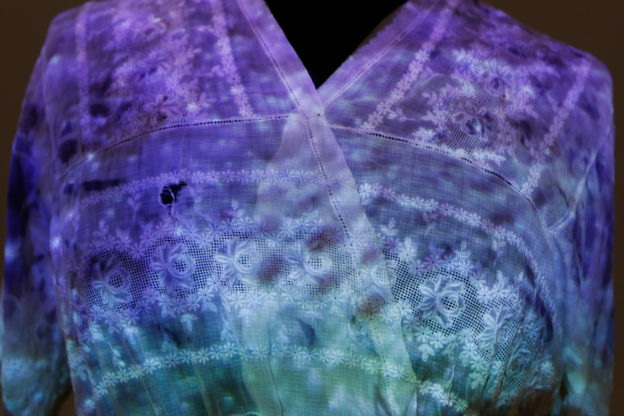 The artist has compensated by filming the process of the bacteria’s purple colour moving across the dress and projecting the film (using 3D video mapping technology adapted by Dumitriu and Alex May) onto the dress. The Communicating Bacteria Dress is of interest here for two main reasons. First it is a case of a nonhuman/ human artistic process. While Dumitriu has provided the medium (the dress), set the process in motion, and documented the results, one could also describe the artwork as a bacterial performance. But beyond the artistic level we are also witness to an example of bacterial agency, communication and what one could posit as a form of subjectivity. The modified Chromobacterium violaceum choose at one point to take part in quorum sensing, a common act by which bacterial colonies communicate via chemical transmission to do a number of common acts ranging from producing light (in Vibrio fischerii) to the production of pathogens for self-defence or sporulation in times of environmental threat. [vi] Quorum sensing seen from this perspective shatters the traditional paradigm of ‘simple’ organisms as incapable of communication and agency. This begs a re-evaluation of ontological and epistemological views of the human/nonhuman divide in philosophy and the humanities in general, bringing them up to date alongside the natural sciences. Shown at Art Laboratory Berlin in 2014 as part of another series, [vii] this artwork was in part the inspiration for the Nonhuman Subjectivities series, in that it’s implications on philosophical, biological and aesthetic levels call for further inquiry into the nonhuman. Considering himself not inter-disciplinary but ‘paradisciplinary,[viii] François-Joseph Lapointe is both an artist and a microbiologist, managing a molecular and evolutionary ecology lab at the University of Montréal. 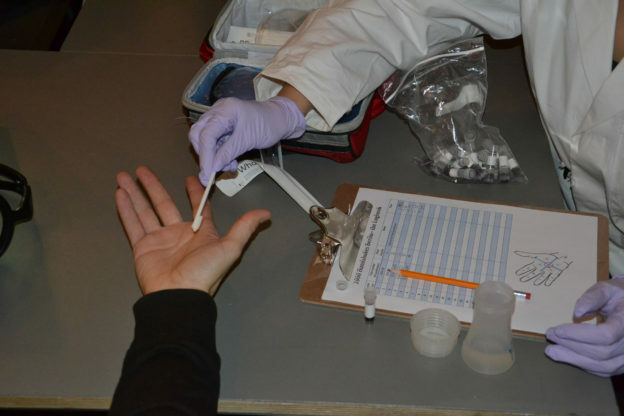 Over the last few years he has combined microbiology and art through a series of performances and exhibitions on the human microbiome. Noting that at least half the cells, and the majority of the DNA in our body is ‘nonhuman’ he has used his own body and that of others to demonstrate the complex fluidity of our combined existences. 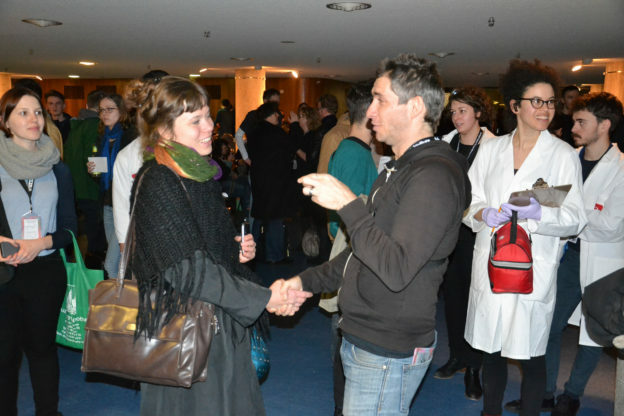 In 1000 Handshakes, which Lapointe first performed at the Medical Museion in Copenhagen in 2014, and in January 2016 at the transmediale festival for digital culture, in cooperation with art Laboratory Berlin, Lapointe literally shakes one thousand hands in a public space. Every fifty or so handshakes a sample is take from his palm. These samples are later analysed at his laboratory. The results are then turned into a series of fluctuating abstract images and animations using bioinformatics software. Lines and colours represent bacterial communities and networks on the artists palm and their fluctuation during the performance. Upon completing six of these performances, Lapointe will now use the data for a scientific paper, completing the paradisciplinary cycle from science to art and back to science. Christian de Lutz is a curator and visual artist, originally from New York. As a co-founder of Art Laboratory Berlin he has curated over 30 exhibitions and developed a number of series, including Time and Technology and Synaesthesia as well as [macro]biologies & [micro]biologies. His curatorial work concentrates on the interface of art, science and technology in the 21st century. Additionally he has published numerous articles in journals and books, and is active in a number of collaborative organisations including transmediale/ re-Source, Synapse (Haus der Kulturen der Welt) and The Berlin Network of Free Project Spaces and Initiatives. 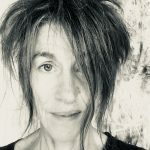 Regine Rapp is an art historian and curator, specialising in 20th and 21st century art – installation art, artist books and art & science collaborations. She worked as Assistant Professor for Art History at the Burg Giebichenstein Art Academy Halle until 2013. She is co-director of Art Laboratory Berlin and has curated over 40 shows (e.g. Time and Technology), published several books and developed several international conferences: Sol LeWitt_Symposium (2011), Synaesthesia. Discussing a phenomenon in the arts, humanities and (neuro-)science (2013). Her new publication [macro]biologies & [micro]biologies. Art and the Biological Sublime in the 21st Century (2015) reflects theoretically on 2013-15.